Tailor made dance courses for Kids : Chinese dance / Ballet / Jazz / Latin dance in recognized exam syllabus Beijing Chinese Dance exam, RAD for Ballet, CSTD for Jazz and ISTD for Latin. Courses for Adults : Yoga / Jazz Funk / Chinese dance / Ballet. Good to exercise your body, relax and shape up your figures. Private classes can be arranged per your convenience. Yoga is for health and relaxation. Studying the depth of the body gives the opportunity to heal sickness by correcting aspects of our mind and driving the energy into the right channels. This course will be focused on the practice of breathing; energy is allowed to circulate properly in the body by cycles of healthy postures and positions. The goal of this course is to strengthen our inner energy. Movement stimulates the body’s internal organs and different corresponding breathing patterns are integrated. Postures like sitting, lying and standing are smoothly and harmoniously connected through the use of breath, which mobilizes the spine, hips and the entire body. Under the direction of our teacher, we can re-educate the body to move more fluidity, relaxation, power and encourage healthier functioning of the internal organs. Tutor:Charles TseYoga Alliance certified yoga teacher who has started practicing yoga 14 years ago. He learned Yoga from one of the best Yoga school in India－Krishnamacharya Yoga Mandiram. We offer 2 levels of Yoga suitable for Beginners & Intermediate Students. Technical Jazz will warm you up with attention to core strength and flexibility. Jazz Technique is the foundation for all dance movement. The style of the dance is fun and energetic, which consist of unique moves, fancy footwork, big leaps and quick turns. This course has a multi-disciplinary approach which provides a strong basis and allows for the pursuit and development of individual strengths and interests. Students will learn the basics of jazz technique: isolations, syncopated movement and coordination exercises. Many other dance styles are included in the jazz dance, such as hip hop, poping, girls and boys funk. Most of the jazz music are arranged with nowadays pop songs, and knead with ballet, chinese dance, spanish dance and modern…. By using different style of songs, and working in with dance compile, students can fully develop freestyle or multi-technique and manage the challenging and gentleness during the dance. We provide dance studio with sprung flooring, full-length wall mirrors and practice bars. Our faculty is one of the accomplished teacher and dancer, who will lead for building the strength and stamina required for musical theatre. Experience the culture... by performing the traditional Chinese dance. 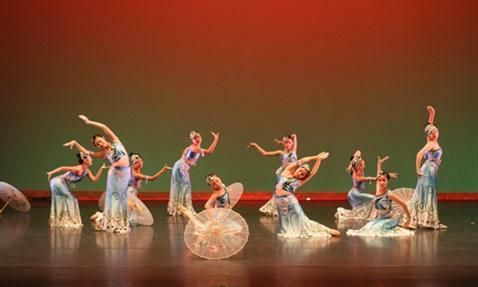 Chinese dance, an uniue code of exploration on feminine, charming, elegant and delicacy. Designed program on training for adults, not only focus on skill of dancing, but ideal exercise to relax muscles and shape-up body figure. Taught according to syllabus of Chinese Beijing Dance Examination. Students are trained for competition pergormances and exams. The classical ballet option is open for those students who want herself with the grazioso and self-assurance body language. Ballet is a highly technical form of dance with its own vocabulary, combined with set of music to create its own dance form. Through excellent training, passionate dedication and sheer hard work, we aim to take our students native talent to create their mind, knowledge, body and technique of the best possible dancers they can and want to be. We provide one of the today’s best ballet teachers. All ballet classes are taught by the distinguished faculty. We appreciate that a classical dancer must be much more that just a strong technician, so there is an emphasis on performance throughout the course. Strength and stamina are strengthened along with the development of individual performance style as the course continues. We offer RAD Examination to students which will increase their experience and participate in a wide range of study.